“She was the best model I ever had,” Norman Rockwell said of Mary Whalen, who appeared on three Saturday Evening Post covers. Meet Mary, now known as Mary Whalen Leonard, who became Norman Rockwell’s favorite model. How did a young girl meet America’s favorite artist? Talking after the game with Mary’s father (who was Rockwell’s lawyer), the artist asked Mary if she would like to pose for him some day. “I said, ‘Sure!’ although I didn’t know what that meant,” she tells the Post. It is significant that the Plymouth ad has no image of the product or even details about the car’s features: The excited faces of the family say it all. In addition to Post covers, Rockwell did a great deal of illustration for advertising. 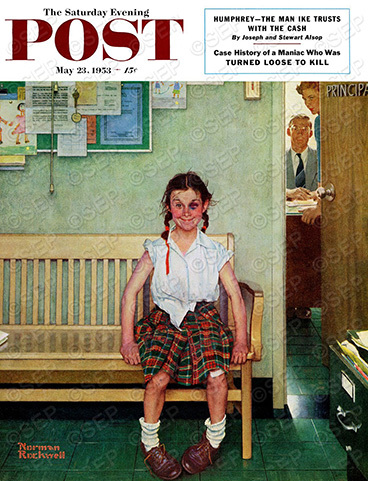 When Rockwell decided to use Mary as the model for a cover about a girl with a black eye, he called for her at the local school. Unfortunately, this had the effect of scaring the child. Having never been summoned to the principal’s office, she jumped to the conclusion she was in trouble. “That was really frightening,” Mary tells us today, “I cried! But my sweet brother—he’s my twin brother, so we were in the same class—held my hand, and we walked together.” She was greatly relieved to discover Rockwell there and find out the reason for the command appearance. But Rockwell’s biggest challenge was getting the black eye right. He tried a charcoal mix on his young model, then makeup, but neither looked realistic. He finally advertised for a real black eye in the paper. He not only got that tricky shiner right, his choice of Mary proved a great one. As a triumphant victor, the model manages the perfect devilish grin, even as the principal and school secretary confer on how to handle the situation. Part II: Mary gives behind-the-scenes details on how certain poses were done as we review the Rockwell cover A Day in the Life of a Girl.